I purchased my first two tarot decks in 1998. I spent the next 18+ years focused on connecting with the cards and providing readings to friends and family. Most recently, I deepened my connection with the Divine ((God/dess, Spirit, Source, Creator, etc)and my guides which allowed me to connect with tarot and oracle cards in a more meaningful way. The cards provide a focus for your questions (or general guidance) and the messages are directly channeled through the Divine, Higher Self, Angels, Animal guides, etc. Are you ready to delve into the mysteries of … well … you? Adryanna is a Reiki Master Teacher, a Certified Transformation Oracle Reader, and a Spiritual Healer. She facilitates the healing of humans and furbabies through her connection with the Divine (God/dess, Spirit, Source, Creator, etc) and Mother Nature. 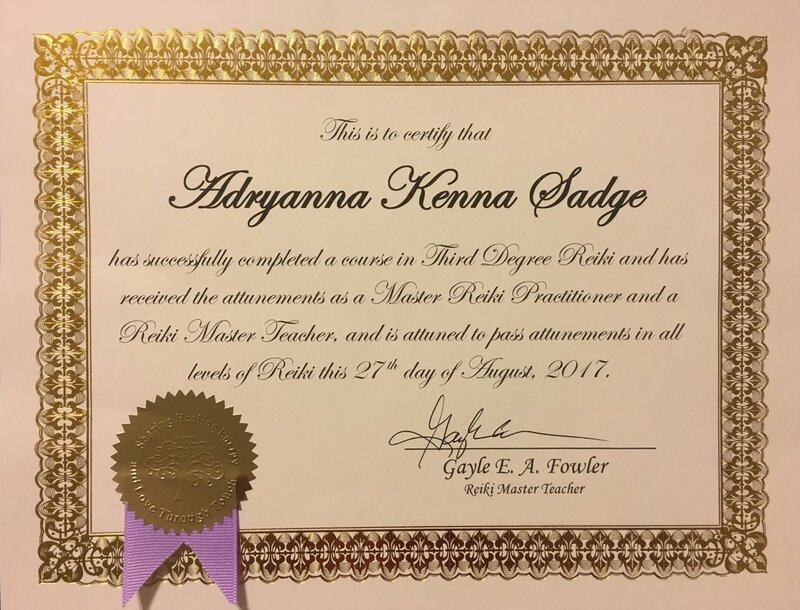 Adryanna received training in Nontraditional Reiki, Shamanic Reiki, Golden Dragon Reiki, and the Feather Way. She also underwent various DNA activations and the Sacred Blue Flame Activation. Additionally, she works with her Spiritual Guides to utilize the Green, Violet, and Gold Flames for energy clearing and healing. Adryanna also receives teachings and guidance from Spiritual Guides and her Higher Self. By integrating various energy healing modalities including Nontraditional Reiki, Shamanic Reiki, and Dragon Reiki, clients have the option to experience soft and gentle healing of the physical, mental, emotional, and universal bodies; or a deep intense healing targeting past lives, ancestral lines, multidimensional lives, and parallel lives. Adryanna incorporates energy clearings and chakra balancing into healing sessions and may also receive messages intended to help clients and deepen their self-awareness. She has the utmost respect for the healing process and the empowerment of her clients.